As we approach the two year anniversary of Hurricane Sandy, my mind wonders back to the steps we took to prepare for the storm. We scurried around town in an effort to stock pile batteries, cases of water, and non-perishable foods. We hunted down flashlights and coolers at our local hardware stores. We fully charged electronics, and mentally prepared ourselves for the worst. We didn't quite know what "the worst" could be, but we would soon find out. Hurricane Sandy hit on October 29, 2012. We lost power that day at around 5 pm. It wasn't restored for almost 6 days. We hadn't planned on losing our power for that long. A few months after Sandy, we started to think about ways in which we could be better prepared for a natural disaster from putting together a kit to having in evacuation plan. 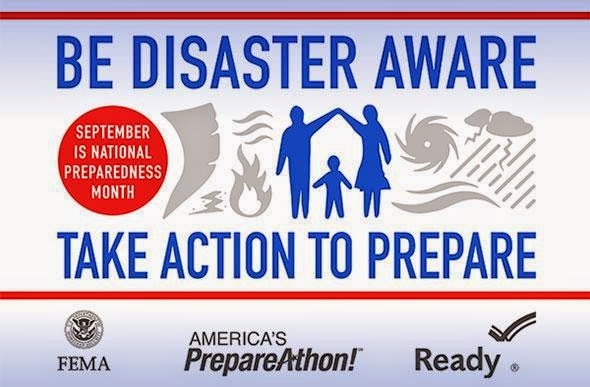 September is National Preparedness Month when the Federal Emergency Management Agency (FEMA) urges Americans to be prepared for any type of disaster, natural or otherwise. Having a plan for your family and how you will communicate with others during a disaster will ensure that you are able to deal with the disaster and its aftermath. During emergency situations, quick decisions need to be made. There is no time for long, drawn out thought processes. identify possible risks in your geographical location. 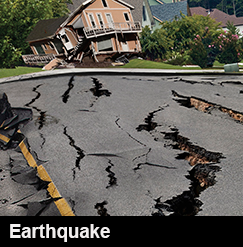 From earthquakes and hurricanes to tornados and wildfires, you need to know what you are up against in order to effectively prepare. This video from Ready.gov illustrates the difference between a family that was prepared for an emergency and one that was not. The important takeaway here is to set a meeting place to gather outside your home. Putting together a plan may seem like a daunting task, but Ready.gov makes it easier for you by supplying you with tools that help you devise a strategy and a plan. Ready.gov offers both evacuation and communication plans for the family and for kids. These forms can be completed online and printed or printed and completed by hand. Once you've completed the forms, sit down as a family and go over each detail, ensuring that every family member understands the importance of them. Communicating with your friends and family when a disaster occurs is extremely important. Know what you will do, where you will go, and how to find each other if anyone is separated. For additional resources and more information on ways to prepare during National Preparedness Month, click here. You can find Ready.gov on Facebook and on Twitter.